Pair of 18th century Italian Renaissance lion carved walnut Sgabello hall chairs. Pair of Flemish carved oak hall chairs, circa 1890. Profusely carved with heads, swags and foliage. 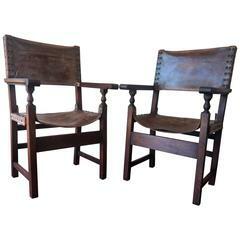 Pair of antique Italy "Sgabello" carved oak chairs, circa 1790. These striking chairs with their elaborate carved details and distinctive profile are modeled after a specific type of stool with a back that first made an appearance in Renaissance Italy. These chairs never had arms because at that time it was common for only one seat in an interior to have arms and it was reserved for the most powerful person in the room. The deeply carved surfaces seen on these chairs recall the time when the inside of a home was illuminated only by the natural light cast by a blazing fire and flaming candles. This kind of light casts dramatic shadows and lends itself to sculptural carving. Please take a moment to enlarge each photograph provided to see the skill exerted by the artisan who made these chairs. The overall balance of the symmetrically placed motifs of scrolls and flourishes is immediately evident and their voluptuous quality recalls the best of Baroque Italian design. Interestingly a "sgabello" chair was kept against the wall in the anteroom or hallway where it remains flat against the wall. This use explains the flat linear quality possessed by the chairs when seen from the side. Obviously these were not chairs designed to loll about in decadent pleasure but rather emblems of a powerful family with a well furnished interior. These chairs will be a strong decorative statement is the entry or hallway of a modern home because of their uniquely sculptural shape. Vintage Spanish Sgabello carved side chair or stool depicting the "Valencia" shield This chairs come from a Monte Picayo Casino, Valencia, Spain. A pair of fine early 19th century Italian carved walnut hall chairs in the Renaissance style. Profusely and beautifully carved with foliage, caryatids and a coat of arms.